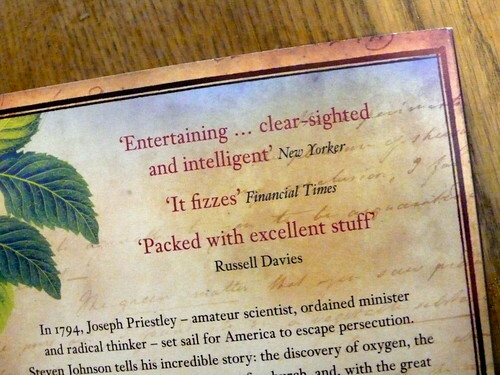 A friend pointed out that I'm quoted on the back of the UK edition of The Invention of Air. I assume this is the result of a canny publisher thinking that using a "Russell Davies" quote stands some chance of positive confusion with Russell T Davies, and the Radio 2 Russell Davies. It's like three endorsements in one. I'm just disappointed that they've selected such a banal quote. Right there, for all to see, is my worst stylistic habit - overuse of stuff - one I thought I'd manage to shed. In fact, for a moment, I was convinced it wasn't me because I couldn't find it in here. But then I tracked it down. I'm such a huge fan of Steven Johnson's work that it's a tremendous honour to be stuck on the back, I just wish I'd had the opportunity to come up with something a little less generic. Ah well. You should read it though. It's packed with excellent stuff.